Have just painted a mural at the back of Hamilton House to brighten a murky spot. Am very chuffed to have been invited to attend this – it’s my first meeting with a children’s publisher. We’ve been enjoying a quiet couple of months here at Small World Towers, but are now out of hibernation and ready to kick off the first set of animation workshops of 2015! 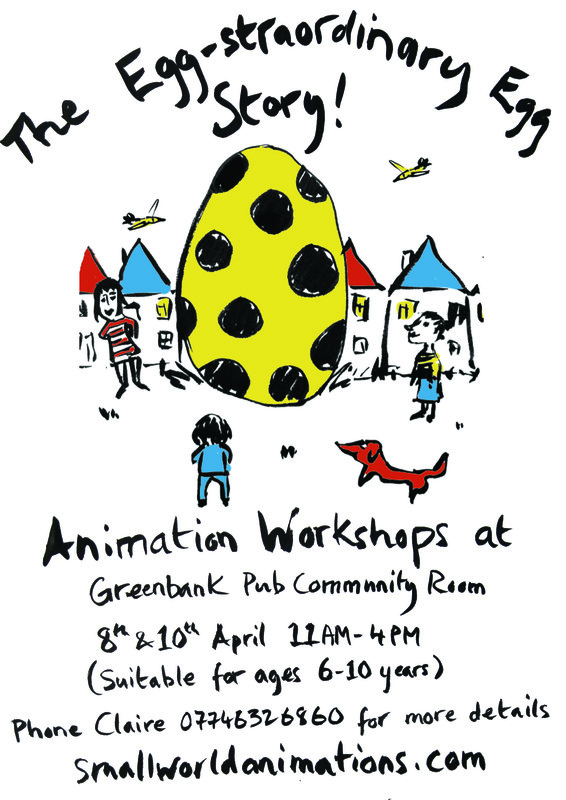 These will take place at the Greenbank Pub Community Room on 8th & 10th April. As usual, we’ll be making an animation from scratch based around a mysterious, giant egg – where did it come from, what does it contain? Is it a good or bad egg…? The price is £40 to cover both days and is suitable for 6-10 year-olds. Call me on 07746326860 for more info or with any queries. Look forward to seeing you there! Hello and Season’s Greetings! 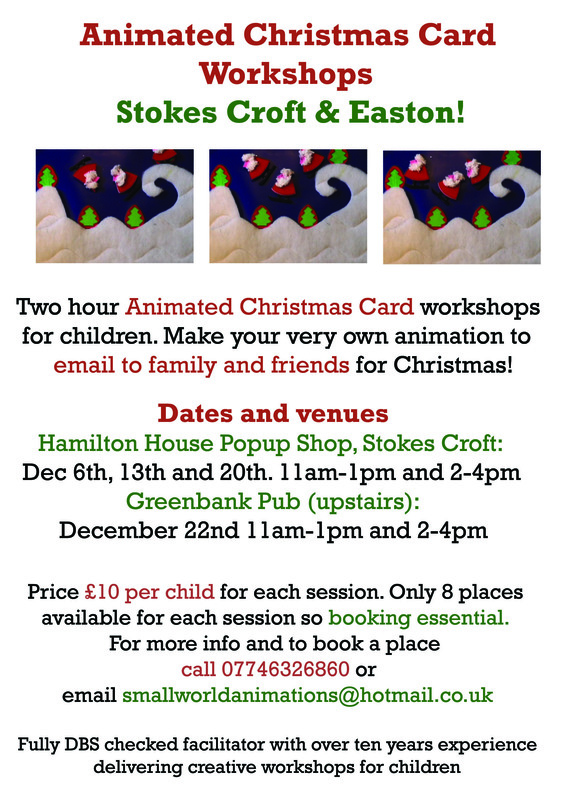 I’m going to be running children’s Animated Christmas Card Workshops every Saturday at the Wonderful Hamilton House Christmas Shop on Stokes Croft *AND* one in Easton Upstairs at the Greenbank Pub on Monday 22nd December. Come and make a short Christmassy animation then I’ll send it to your email address for you to send on to your friends and family! More details on the flyer below, or do give me a bell 07746326860 if you want more info. I’m in the middle of an exciting animation project at Felix Road Adventure Playground. Everyone’s doing really well – here are a few early tests with cutouts and models made by the kids! Hello Easton animation peeps, here’s your animation, I hope you enjoy it! Hi everyone, here’s your animation, I hope you enjoy it!